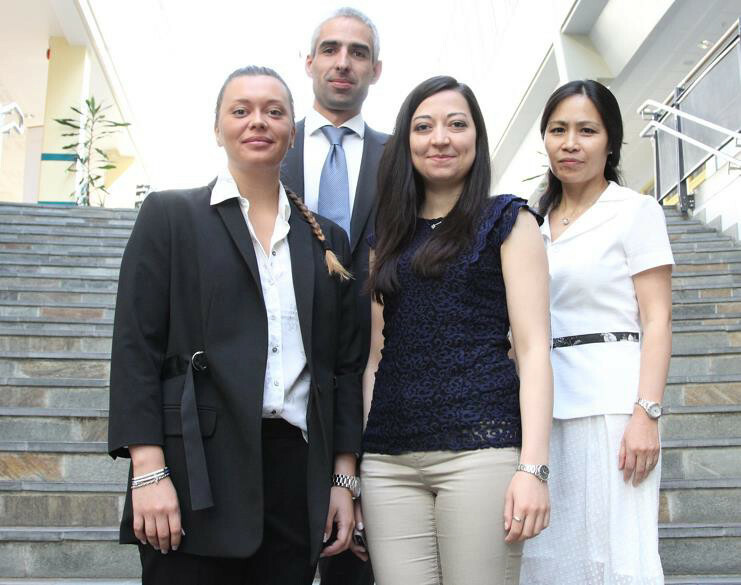 UiT – The Arctic University of Norway reaches out to support local industry – just one example! The Institute of Industrial Technology at UiT Narvik – The Arctic University of Norway works closely with industry in its region with a focus on R & D associated with “Small – scale intelligent production systems“(SIMS). One example is the highly successful assignment carried out on behalf of a major fish processing enterprise (Karlsen Brothers) at Husøy in Troms (Norway) which centred on the company need for automation of processes and associated inventory management and logistics. The work carried out was part of a collaboration between the UiT Narvik, Study Centre Finnsnes AS (Vidar Gunnberg, General Manager), BrФdrene Karlsen, and supported by InterReg Nord and Troms county. A new stage of the automation process is being supported under the TARGET project. Pictured: Front Row – Masters Students Maria C. Paulsen and Tanja Kerezovic, who worked on finding optimal solutions for the BrФdrene Karlsen project. Back Row: Associate Prof Gabor Sziebig and Prof Wei Deng Solvang, Head of the Institute of Industrial Technology at UiT Narvik. The March 2017 partner meeting and annual get-together of the TARGET project coincided with the hosting of a magnificent Technology Festival/ Conference (TINN) in Narvik. The 2017 TINN festival was the merging of the TINN and Narvik Harbour Conference into Rallardagene. The conference, and associated events, brought together a large gathering of internationally renowned experts and academics to consider and discuss a wide array of specialist topics ranging from the aerospace industry, digitalisation and production logistics for small business, renewable energy and energy efficiency, transport and transport infrastructure, as well as government priorities for Norway’s growth industries. The conference was supported and facilitated by UiT – The Arctic University of Norway (Anne Husebekk, Rector) and Narvik Municipality (Rune Edvardsen, Mayor). Three TARGET partner representatives (Prof Åsa Ericson, Dr. John Moore and Dr. Sakari Pieskä) made presentations at the Conference on engagement with SMEs to promote sustainable business development and global competitiveness via enabling technologies and applications, and focussed on the TARGET manufacturing supports toolbox. 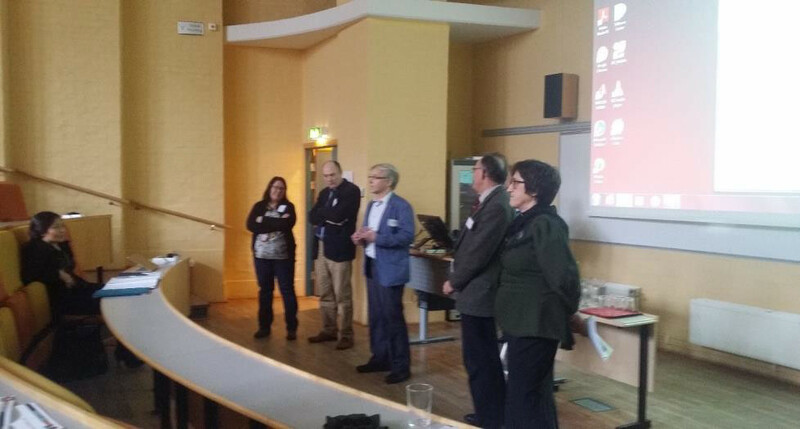 Representatives of the TARGET project partners taking part in a Q & A following their presentations to the conference. L/R Prof. Åsa Ericson, Luleå Technical University (Sweden); Dr. John Moore, South West College (Northern Ireland); Dr. Sakari Pieskä, Centria University of Applied Science (Finland); along with Prof. Constantinos Soutis, University of Manchester; Edel Storelvmo (Conference Chairperson), UiT Norges Arctic University. The first part of the meeting focussed on a range of topics, including a detailed review of the current status of the project in relation to the overall project plan and performance indicators. Individual partners reported on progress under their work package. Particular focus, and attention, was given to engagement with participating companies-engagement models and questionnaire format were presented and considered in detail. This was followed by a partner report and discussion on the manufacturing supports toolbox, which is at an advanced stage of development and testing. It was agreed that the responsible partners would follow through on the discussion, and in particular, finalisation of the diagnostic questionnaire. Partners also received a lengthy and detailed presentation on a specialist 3D lab, followed by a very informative visit to a TARGET champion company, BrФdrene Karlsen at Husøy. 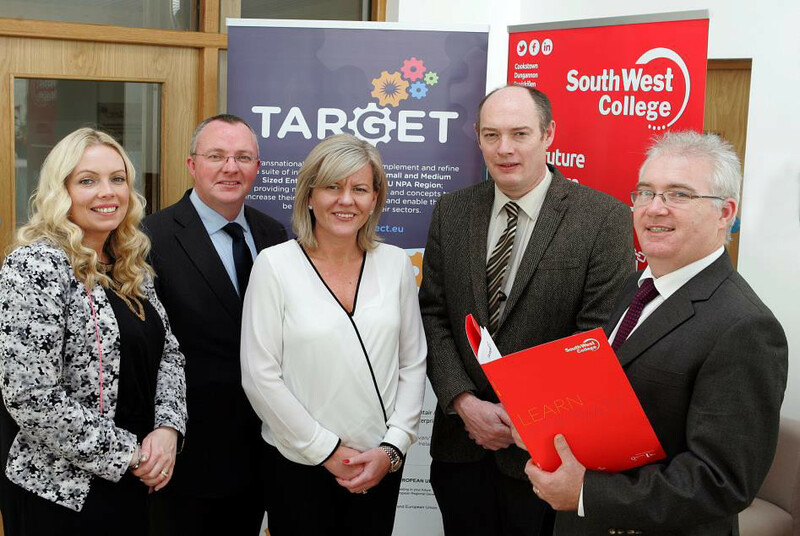 South West College (SWC) organised a highly successful and well attended First Annual TARGET Conference on 22 November 2016. The Conference theme was “Opportunities in Digital Manufacturing”. 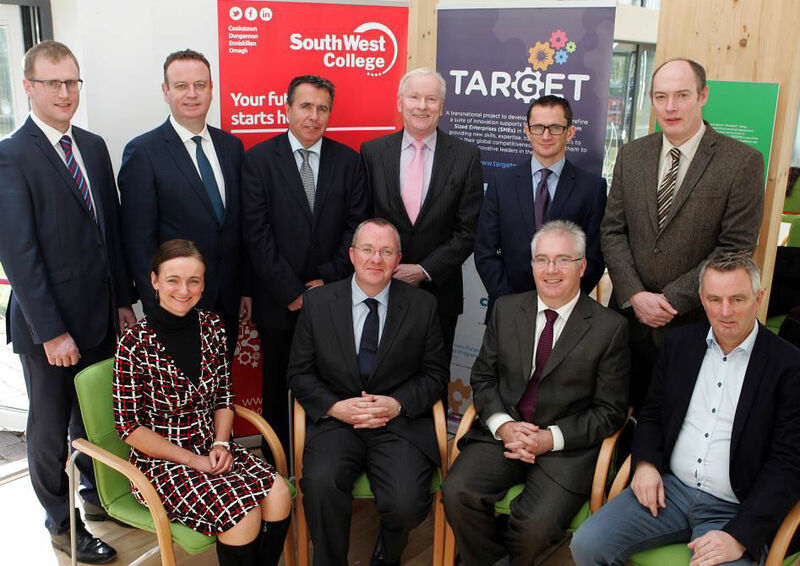 The event, hosted in the College’s state of the art Passive Pavilion at the Centre for Renewable Energy and Sustainable Technologies, brought together a large gathering of TARGET project professionals, academics, SMEs and industry representatives (from Northern Ireland and the Republic of Ireland), as well as officials from government bodies and institutes. In addition to promoting opportunities in digital manufacturing, a key objective was to advance the TARGET project’s goal of making regional manufacturing globally competitive and innovative. Opening the event, Padraig Mc Namee, Head of Technology at South West College noted how recent government policy and investment in digital infrastructure was recognizing how exploiting digital technologies offers the most cost effective way for maximising competiveness and improving products, processes, productivity and profitability. He highlighted how modern technology allows for great interaction, particularly between manufacturer and consumer, saying ‘the internet must now be pervasive, no one in the office or organisation should be non-digital’. Left to Right; Front row; Lyn Sharkey(ABCON Ltd);Dr Stephen Brennan;Padraig McNamee(SWC);Vidar Gunnberg (Finnsness Study Centre Norway)Back Row; Aaron Black (SWC);Stephen Kelly(CEO Manufacturing NI); Michael Polson(InvestNI);Vincent Reynolds(CavanITC); Paul Hermon(Queens University Belfast); Dr John Moore(SWC). Prof Wei Deng Solvang from the Arctic University of Norway; Prof Asa Ericson, Luleå University of Technology, Sweden; Heidi Kaartinen, Centria University of Applied Sciences, Finland; and Vidar Gunnberg, CEO of Finnsnes Study Centre, Norway, spoke about some of the industries located in their respective countries, the issues and challenges faced by industry there, and how the TARGET project is helping to address (these issues /challenges). Other speakers at the event included Stephen Kelly, CEO of Manufacturing Northern Ireland; Dr. John Moore and Aaron Black (SWC); Michael Polson, Invest Northern Ireland; Paul Hermon, Queen’s University Belfast; and Lyn Sharkey, ABCON Industrial Products Ltd, Cootehill, Cavan, Republic of Ireland. Pictured at the Enniskillen Conference (L/R):- Edel McCusker TARGET Manager (SWC), Dr Stephen Brennan, Sarah Reid (Special EU Programmes Body), Dr John Moore and Padraig McNamee (SWC). The possibilities which digitalization and innovation functions can offer for SME’s were considered at an international TARGET partner meeting organized by Centria University of Applied Sciences in Kokkola 11-13 October 2016. Centria’s campuses are located in three towns of Central Osthrobothia – Kokkola, Ylivieska and Pietarsaari – the two first mentioned were visited during the meeting. The partners shared experiences about working with their tools on SMEs and reflected on elements of the project plan yet to be delivered. 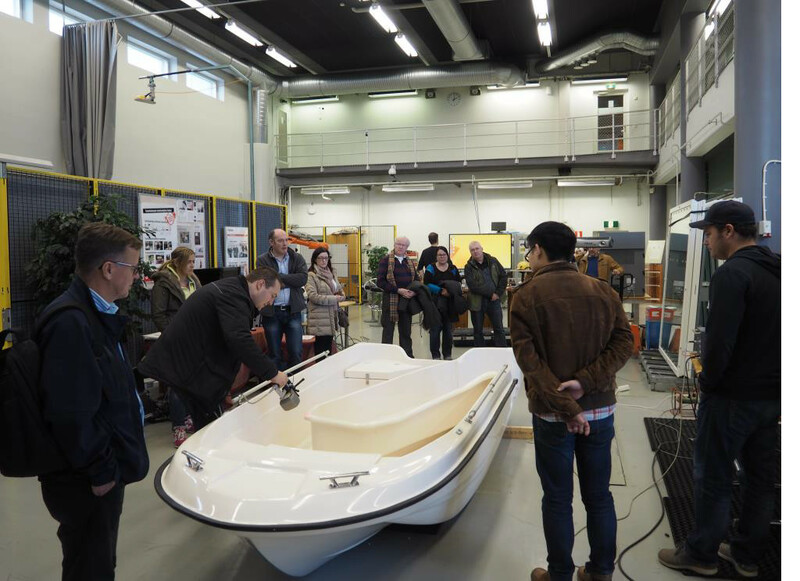 This was followed by a presentation of the Kokkola campus laboratories, and demonstrations of RFID and other technologies, including robotic welding. Following a visit to a very successful family spring water manufacturer (Finnspring), including their innovative storage racking system, the partners visited Ylivieska campus, where they were introduced to 3D-visualizations on Cave Automatic Virtual Environment (CAVE) with Vive virtual reality glasses. 3D-scanning and possibilities of robotic technologies for product development and production were also demonstrated in Ylivieska. These techniques have already been used in several TARGET projects of Centria. The partners gathered on the final day to discuss the ongoing delivery of the project, including expert exchanges and partner visitations, followed by participation at the CentriaOpen event attended by companies from the region involved in Centria’s projects, including TARGET. Demonstration of 3D laserscanning for partners of TARGET project at Centria University of Applied Sciences in Kokkola. With a scanned file a three dimensional model of the product can be constructed and it can be easily worked on, for example to print with a 3D printer. TARGET partners at CentriaOpen event. 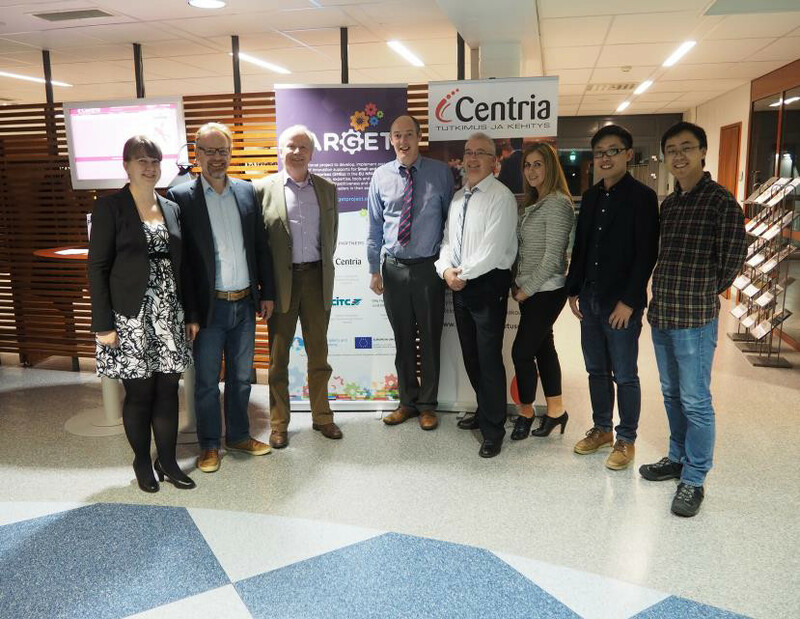 L/R: Heidi Kaartinen and Jouni Vähäsöyrinki (Centria), Vincent Reynolds (CavanITC), John Moore, Padraig McNamee and Anne Loughran (SWC), Hao Yu and Beibei Shu (UiT).